This was the other book that I heard so much about last year and how so many loved it, again I wondered, and this time it proved right. This book was not that good. Luce was in a fire and her boyfriend mysteriously died, now she is at a new school filled with troubled kids and those that has done really bad things. Here she meets Daniel, this strange boy she feels like she has met before, and then there is the other guy who also likes here and so it goes on. Now why didn't I like it? Well it was really hard to get in to, I wanted to skim, but read on and hoped it would pick up..it didn't. Finally when I had read half the book something started to happening and I thought yes! Fallen angels and paranormal stuff! Sadly I was mistaken, it was this climax that ended in nothing. So I started reading again hoping for some paranormal stuff. Nope. Instead there was Luce stalking Daniel, hanging out with friends and meeting this other guy. Then finally, finally at the end some paranormal stuff happened and I hoped to get some answers, short answer..no. 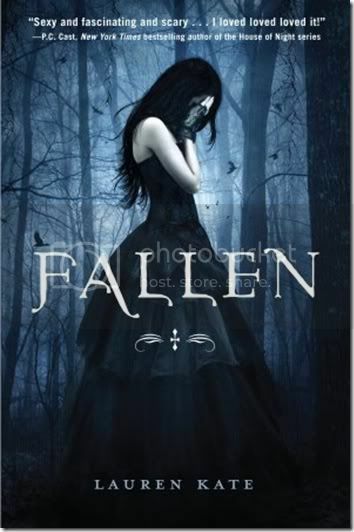 I learnt that there are fallen angels, well yeah, I read the back cover. And that there is reincarnation, yes I kind of guessed that in the beginning too. So in the end nothing at all was explained and it left me really frustrated. I had wanted some more paranormal action and explanations. Now to my other objection that I have seen around. This is a school where some kids are dangerous and wears tracking bracelets. But everyone sneaks around, Luce goes swimming with Daniel who she doesn't know. They seem to do what ever they want. There is no security, well ok those cameras, but it's doesn't feel like anyone is actually watching the tape. It's just like any other boarding school. This one felt too drama and teen for me in the end. I wanted explanations, I wanted something to happen, but there was nothing. People can like this one even if I didn't. It does have star crossed lovers and the eternal love triangle so some will go for that. But for me it was lacking. And it could have been awesome. Perhaps the next one has something more in it. Blodeuedd's Cover Corner: I do love it, but in the book she has short hair cos of the fire. Final thoughts: Some will love it, some might feel like I did. I've read mixed thoughts on this one too. I'm going with yours and not bother to pick this one up. Great honest review! From what I've read this is one you either love or hate; I have it on my bookshelf but Im a little hesitant to pick it up after being disappointed with Hush, Hush. This one didn't work for me either. It had potential but fell short all over the place for me. I won't be reading the rest of this series. Ugh, I've read so many conflicting reviews of this book. I have it though, a friend said it was a must read. It actually is too, cause like you Blodeuedd, I'm wondering about all the hype. To me, it's a good book and I want to read the sequel, but I felt cheated. As you said, no real climax and it all ends so abruptly, with more questions and answers. I just pulled this out the other day to read because I had read a great review on the sequel. I am glad you wrote this review before I read it. Thanks. I agree with you Blodeuedd, I didn't think it was much either. Called it insubstantial in my review. I felt pretty much exactly the same way about this one!!! The first 300 pages were soooo slow!! I've seen mixed reviews on this one. sorry you didnt enjoy it, thanks for the honest review. I really didn't like this book either. I thought it was far too overrated. I've been eyeing it since it has a beautiful cover. Perhaps I'll let this one go. Great review! I reviewed this too - there are so many mixed reactions. I enjoyed it, but you are right about the really young teen theme, and I overlook that at times, as I'm not a really young teen myself LOL However, the ending did leave me feel 'cheated' - a bit of a let down. What a shame you didn't enjoy this book. I did and am looking forward to reading the next book. I am not a YA reader by any means as some issues in these teen books I do have issues with..
Is there a second book to this - it might clear up some of the ending for you.. It is annoying when covers don't at least get some basics detaisl right.. I have this one, too. I haven't read it yet, but tend not too like too "teenagey" YA novels. Oh yes there is a book 2, I always knew that, but it just annoyed me cos nothing was given, nothing, and I just came out of it with a big ? Ugggggh, I have this one to read. I had heard some mixed opinions on it but got it anyway. I'm not in a rush to read it but I wish I had gotten it at the library instead. Good and honest review, B! I have seen reviews where the reader loved this book and some where this book was disliked. It seems to be one or the other with this one really. I'm in no hurry to read it but I might just pick it up one day.